I chose green and grey basically at random, and am wondering how to to represent them properly. The login button is the main action, since this screen will only display to users typing in a URL directly, which I think should mainly be existing users. How can I show this? The color of the login button should match the primary color of your style theme. Apparently, you're using material design. If your theme, for example, uses blue (#2196F3) as a primary color, your primary action buttons should also be blue so they are contrasting the rest of the page and are easily distinguishable. The "Register" button which is the secondary action in the page should be less prominent than the primary action, therefore not colored. 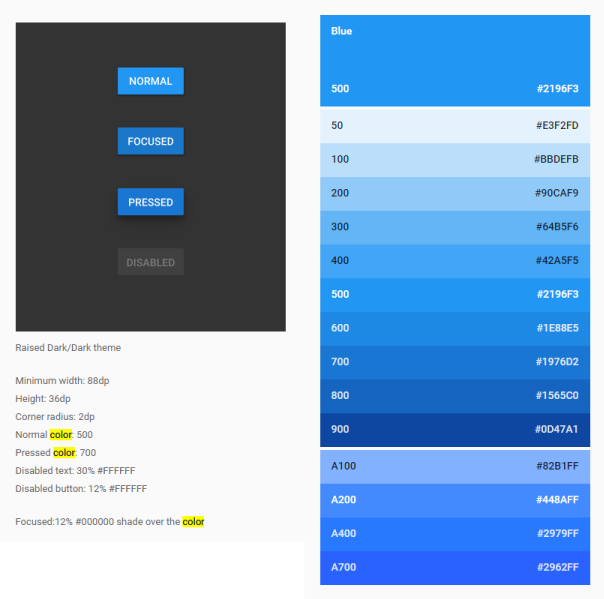 You can view color style and button guidelines from google material design. Your "call to action" doesn't have to be green, it just has to be consistent. Start with your design guide if you have one or create one if you don't and provide a consistent look and feel across you application/site. Red for ending: cancel (end the action), delete (end the existance), close (end the application/popup), hang up (end the call) to name the most common ones. Green for approval: accept call, confirm action. For login or register, there are no common colors (at least as far as I know). So rather than trying to use the color to describe the action, just use the difference of colored vs. not colored, where the color should be the defining color of your theme. In general, only color one "default" button per view. The default button is the one that people are usually going to use (in a psychological way, you could also argue it is the one you want the people to use). For the login form, that would be "Login", since you register once but login every time. Hence, the color of the register button should be "none" (just a link or a white button, if you want to stick with a button), whereas the color of your login button is dependent on your "corporate design". At all times, keep in mind that roughly 5% of any user group are color blind. For your example, those people would see two gray buttons. In addition to @KristiyanLukanov answer, when the buttons are disabled don't use color. Disabled: Buttons shouldn't have color if they are not enabled. Enabled: Both buttons can use the accent color or only one, if you want to emphasize it. Isn't the confusing thing that a new user wanting to register is being presented with a request for a non-existent password? Or is he being asked for a password that he will be registered with when he presses that button, in which case how does he know he has typed it correctly? 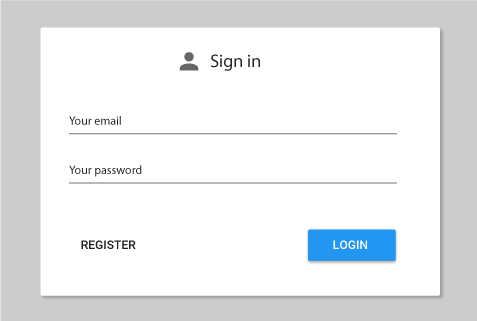 So I would have thought that the first thing the user sees should simply have two buttons LOGIN (to existing account) and REGISTER (as a new user). Having the bracketed texts on the screen near the buttons might also be useful. LOGIN will then simply ask for user-id and password, REGISTER for whatever else is wanted before you create a new user. If it's a question of not wanting more than one round-trip to the server for efficiency reasons, just have the email and password fields hidden until the LOGIN button is clicked. Possibly likewise for REGISTER and its associated fields, if it's not a multi-screen registration process. Alternatively present a LOGIN-only screen with an obviously-different "Not yet registered? Click here to create your free account" (or whatever) styled as an obvious hyperlink, not a button. After all that I'm not inclined to think that the colour of the buttons matters provided they aren't in the error - warning - alert spectrum of expectations (usually red through yellow). Personally I like blue. The overall colour theme of the site is relevant here. Not the answer you're looking for? Browse other questions tagged forms buttons login color color-scheme or ask your own question.